Looking for great deals on Apple products this friday? Head to the Apple Online Store for Apple’s annual Black Friday Sale! 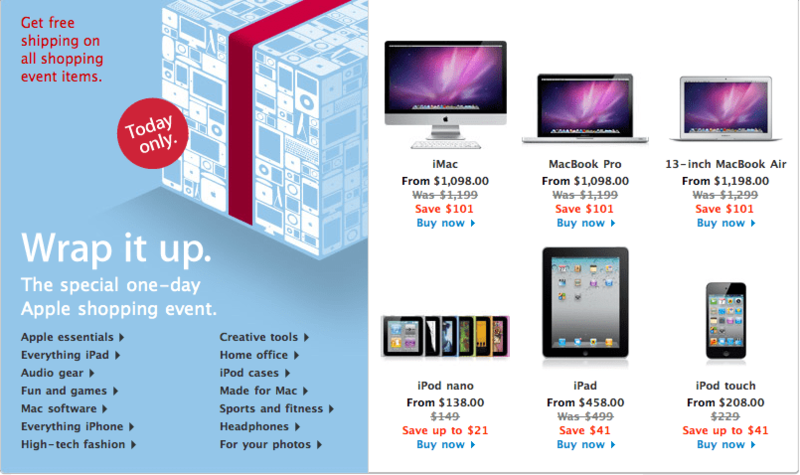 You can save $101 dollars on iMacs, MacBooks, MacBook Pro’s, and MacBook Air’s, as well as $41 on iPads and iPod Touches. You also can save on accessories for the iPad, and there are many huge savings from brands other than Apple. Apple is pushing the iPad before the Holiday season in attempt to boost sales and beat the growing competition, and you can get the best prices on iPads and iPad accessories because of this. Go to http://store.apple.com/us/browse/campaigns/holiday/giftguide/black_friday?aid=www-naus-bdfo-fy11-bf00001&cp=bdfo-fy11-bf0001 to see the list of all the deals on the Apple Store. Also, if you are shopping online or even going to stores to find the best Black Friday deals, make sure you have your iPhone handy with these great Black Friday Apps. First, The Dealmap is a great app for Black Friday that finds deals in your location and brings up Google Maps with directions to the stores offering discounts and information on the discounts. This free app works year-round, and is very helpful if you’re planning to go to multiple stores searching for deals today. Want to make sure you have the best deal for a specific item? Use Shop Savvy, a free app that, when you take a picture of the barcode of a product, gives you the best deals for that product and shows you which stores around you have that item in stock. The Black Friday App allows you to browse Black Friday ads from many different stores and retailers, as well as create a Black Friday shopping list. This app can be helpful in solving arguments with salesmen about incorrect pricing, as well as creating a list of the best deals on products you want.